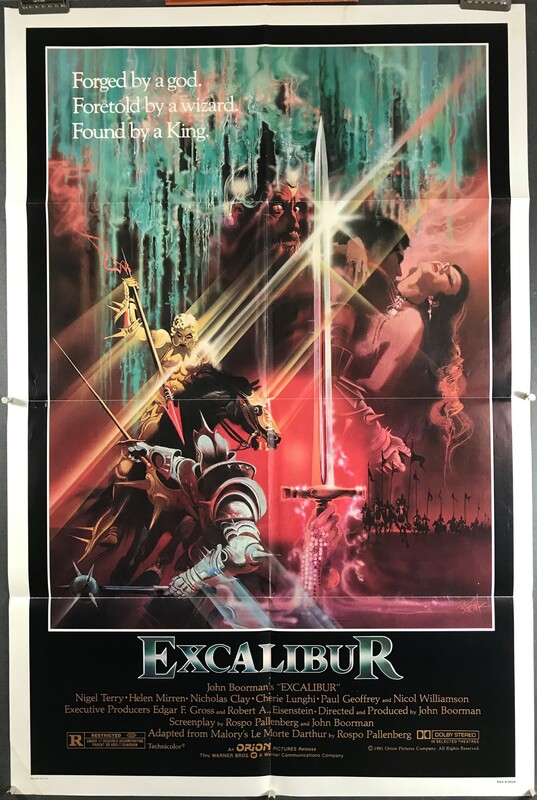 EXCALIBUR, 1981. Original Folded 1 Sheet (27 x 41” / 69 x 104 cm) Movie Poster starring Nigel Terry, Helen Mirren and Nicholas Clay. Directed and produced by John Boorman. “Forged by a god. Foretold by a wizard, Found by a King.” The movie is set in the mythical times of King Arthur and follows his adventure to defend his throne against his evil half-sister with the help of the all seeing wizard, Merlin. This folded 1 sheet poster is in very good original C8 condition and has no major flaws to speak of. The edges and corners are crisp and without pinholes. There is some slight color loss along the fold lines, which could be taken care of during the linen backing process. Linen Backing is available for an additional $80 upon request or by adding the service to your cart below. This would produce a flat, backed poster that’s ready to display! Retouching the color along the fold lines is optional but included in the service. We linen back and frame all of our posters IN HOUSE at our studio in Katy, TX!